Megan - We were interested in asking whether we can build more resilient plant communities through restoration, in particular by incorporating climate change models into seed sourcing decisions. Chris - And what strategies are there at the moment for doing that? Megan - So we focused really on seed sourcing, so in terms of how you source your seeds for restoration, it's often quite local. You select seeds that are from near the restoration site with the hope that they are best adapted to the local conditions. Chris - Right, so what's wrong with that strategy or why shouldn't that be a sound approach? Megan - Well, it can go awry when you're planting a long-lived species such as a tree in a changing environment. So they're locally adapted to the current conditions but the conditions are changing and so they may not be adapted to future conditions. Chris - But aren't you sort of asking for the arboreal equivalent of a crystal ball, because no one knows what climate change is going to do to a different geography and no one knows how the species or any species is going to respond to that? Megan - That's true and so there's climate models out there. They're not perfect, but we can make a best guess as to what we think will be the best seed sourcing strategy. And in particular one of the issues with going quite locally is you have a reduced gene pool to select from. And so when you begin to source more broadly you can incorporate more diversity and then you have that genetic variation there that you need for these unknown things in the future. Chris - So why doesn't everyone just say "Well the simple solution is then to just source really broadly because then I'll have loads of diversity and I've safeguarded the future?" Megan - Because they're quite worried about this idea of local adaptation, that over long periods of time these plants have become locally adapted to their environment where they live. And so that potentially seeds from further out might not do well in that environment so there's a real concern about local adaptation. Chris - So how did you pursue it? What did you do to try and nail which is the more dominant or more important determinant? Megan - What we did is through a citizen science program, we obtain leaf samples from trees across this species distribution, and then we genotype those at about 10000 genetic markers. Using those markers we generated a model explaining how those markers are associated with geographic location and the climate variables at those sites. Then using that model we can project the model on to predict future climates to see how we expect that different genotypes will fare in different climates. Chris - And what emerged? Megan - The first big finding was, we looked just at the patterns of gene flow across the landscape. And so now remember these are 200 year old trees. And so we're really looking at a historical baseline of natural gene flow prior to a lot of the habitat fragmentation that we see now. And we found the gene flow extends really far. We estimated it extends beyond 500 kilometers. That means then when sourcing seeds we can source quite broadly across the landscape and mimic that and have that historical gene flow. Chris - So when you say gene flow this means that a tree in position A, there's evidence from your data that that's been exchanging genes with trees up to 500 kilometres away? Chris - So that's a big distribution isn't it? Megan - Yes it's quite broad. So in some of these species historically they would source seeds from within 15 kilometres of the restoration site. Chris - But can there not be superimposed on some of these gene flows from further afield, more local effects so you could actually have both things going on so you could be still robbing Peter to pay Paul if you go too far afield? Megan - So we did not specifically look at those local adaptation and very specific genes, we took a genome wide approach to look at the overall genome signal. But one thing we can do in a future study is use the data that we've collected here and begin to look at that. 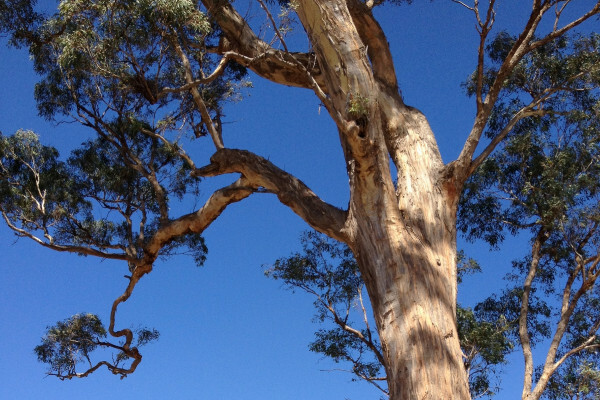 Chris - You also looked at one particular eucalypt in Australia didn't you? So what extent can I say right okay that applies to eucalypts in general or that applies to an oak tree? Are they likely to be quite different or quite similar? Megan - I think there will be similarities in other tree species that have similar pollen flow. And so while this analysis is particular to this specific species, I would think that in species with similar life histories you would expect to see a similar pattern. Chris - Did you look at epigenetic effects as well because that's become apparent in recent years, that we can see this having a heritable effect so that species can react to the exigencies or particular opportunities in a particular environment? Now you wouldn't see that if you just looked at the genetic code would you? Megan - No and we would not see that with this and we did not look for epigenetic effects, and it's hard because these are really complex systems that have a lot of things going on and so we focused on these two particular things of gene flow and climate change. Chris - So pulling it all together then, if you were now writing the guidebook on how one should collect seed to restore a species or ensure and safeguard the future of a species, what are your bullet point take home messages that this study suggests we should adopt? Megan - So the first thing I think for this species is again going more broadly across the landscape, and so incorporating seeds from a wider distribution to incorporate more of that genetic diversity that naturally occurs in this species. And the second thing would be; we generated a model that allows us to predict how well different genotypes will perform at a different restoration site. And so from that we can generate a map that suggests where are the best collection sites for a given restoration site and so that's a useful tool because you can incorporate that with other knowledge that you have to figure out where your best likelihood of success is.